At a recent event Huawei made a number of announcements regarding its strategic direction for the next few years, with an emphasis on 5G. The event was Huawei’s own Global Analyst Summit in Shenzhen – the 15th such occasion. It managed to fit some substance in among the usual self-congratulation and miscellaneous corporate propaganda and, while we weren’t there, we spoke to Counterpoint Analyst Neil Shah who was and who has been tweeting prodigiously throughout. Huawei seems to be pretty handy at SoCs these days, with Shah saying it pretty much caught up with Qualcomm from 4.5G onwards. “Almost two in three Huawei smartphones sold in Q4 2017, had an in-house Kirin branded SoC, rest was Qualcomm or Mediatek,” said Shah. Another thing Huawei shared was that building a 5G smartphone is more challenging than 3G or 4G as these will include multi-modes (2G,3G,4G,4.9G, 5G SA/NSA) and mmWave support, which makes the RF integration and positioning more complicated. “Furthermore, a 5G phone needs 5x more processing power, 2.5x more power consumption and 1.3x board size. So Huawei is working on building ASIC 5G chips for smartphones, which is phenomenal! ASIC chips are used for bitcoin mining, so maybe in future you can mine bitcoin on your phone. The silicon side of things from Huawei often goes under the radar, perhaps because it’s involved in so much other stuff. “They have been almost on par with Qualcomm in terms of performance (from my personal experience) and in terms of technology not far behind especially 4G onwards due to growing share of 4G and 5G patents and IP,” said Shah. 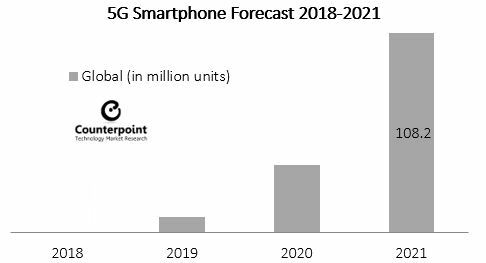 The other main pillar of 5G is IoT and Huawei seems to be serving up some pretty competitive silicon in this area too. “Huawei has pioneered NB-IoT networking and is driving the ecosystem from chip (Boudica) to platform (LiteOS) to cloud (Huawei IoT cloud),” said Shah. “Huawei’s upcoming Boudica 150 in Q2 2018will integrate MCU and modem into one single chip with a target cost of under $2, which is very disruptive considering the average LTE-M to 4G chip goes for $10 to $70. Also it will allow faster time-to-market, bringing it down from months to weeks from an interoperability and testing perspective. So far most of the chipsets in the IoT modules have been discrete (as opposed to integrated SoC) solutions. To underline these lofty aspirations Huawei has published a report entitled Global Industry Vision 2025, which features a bunch of predictions and forecasts distilled in to three main ‘visions’. Firstly it sees 40 billion personal smart devices and 100 billion connections around the world by 2025. Secondly it anticipates 60 million vehicles will be connected to 5G networks and 100% of new vehicles connected to the internet by that time. Lastly Huawei predicts that the digital economy will be worth US$23 trillion in seven years. Huawei likes these big corporate extravaganzas and, while there is usually a fair bit of forgettable hot air, they also serve as a pretty substantial statement of intent and throw down the gauntlet to its competitors. Ericsson and Nokia used to do more of this sort of thing and must feel under pressure to raise their game once more each time one of these is held.